Annual memberships are from March to February each year. GHPEC is a locked facility, when your membership is processed you will be sent the gate combination. Always keep the gates closed, members are responsible for any non-members they let enter. All memberships must be purchased prior to use of the facility. Riders and instructors using the park must be members of the park prior to use of the facility. It's that easy, you'll receive your membership in the mail promptly. 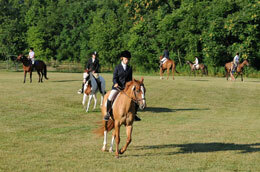 You may buy an annual membership or a day pass to Green Hill Park Equestrian Center online at the Roanoke County Parks & Rec website. You must create an account on the Roanoke County Parks & Rec site in order to purchase a membership online. Please use the links below to purchase your membership/day pass on line. For family and individual memberships you will receive an email with the gate combination. On occassions where a guest may wish to ride at the park with a current member, or a non-member may wish to participate in a clinic, you can apply for a one-day pass to the equestrian center. Note: you must be with a current GHPEC member to use a one-day pass. These passes are priced so that if you are going to ride at the park more than once in a year you are better off purchasing an annual membership. One-day pass applications must be received and processed PRIOR to the day of use.